I cannot fault this product on anything but the packaging – which is glass and therefore impractical for travelling. It does however come with a screw top lid AND a pump which is great. The product itself does exactly what the bottle says, its absorbs immediately and leaves my hair moisturised, shiny and soft. I wash and condition my hair as normal then towel dry it gently before squirting 3 pumps in my palm. I then rub my palms together and run them through the mid section to ends of my hair. I then use my Tangle Teaser to brush through my hair and leave to dry naturally. If the ends look a little dry after it’s dry I will use another half pump just on the ends. This product has honestly been a complete miracle worker. My hair has been bleached, highlighted and dyed very dark then lifted to my natural colour again. It is also consistantly abused by straighteners, curling tongs, heated rollers and the dreaded backcombing brush which unfortunately cannot really be avoided in my line of work. 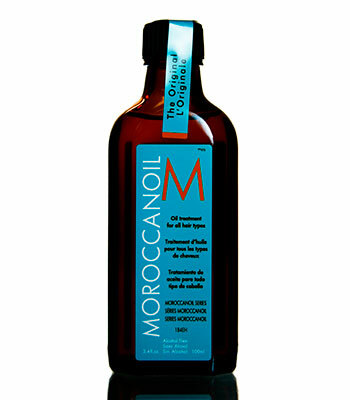 Moroccan Oil is something I just can’t live without and is perfect if your hair is dry or damaged and needs some extra love. I bought mine for £30.45 from my local salon and bearing in mind I use it every day, it lasted me just over 2 months and for the results I get it’s worth every penny!